Assuming that we want to be compatible with the NBS Internet Protocol and its address structure, we could go to the FCC a nd ask for the assignment of a DNIC for the worldwide Amateur Radio packet network. That would be one international DNIC for hams. The alternative would be to have each Radio Relay League go to their respective telecommunications authorities and get one for each country's Amateur Radio service. That alternative doesn't make a lot of sense in that it can be expected that some countries will assign a DNIC, but most will not. In any event, the DNIC is assigned by higher authority. We (as a network) need only concern ourselves with how to allocate the last 48 bits. 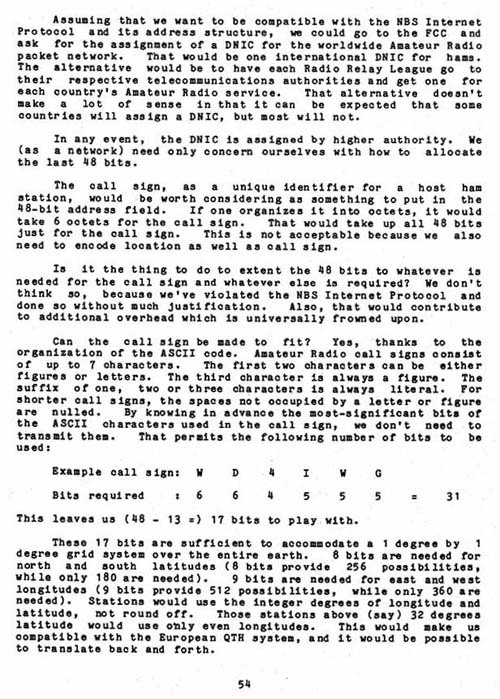 The call sign, as a unique identifier for a host ham station, would be worth considering as something to put in the 48-bit address field. If one organizes it into octets, it would take 6 octets for the call sign. That would take up all 48 bits just for the call sign. This is not acceptable because we also need to encode location as well as call sign. Is it the thing to do to extent the 48 bits to whatever is needed for the call sign and whatever else is required? We don't think so, because we've violated the NBS Internet Protocol and done so without much justification. Also, that would contribute to additional overhead which is universally frowned upon. This leaves us (48 - 13 =) 17 bits to play with. These 17 bits are sufficient to accommodate a 1 degree by 1 degree grid system over the entire earth. 8 bits are needed for north and south latitudes (8 bits provide 256 possibilities, while only 180 are needed). 9 bits are needed for east and west longitudes (9 bits provide 512 possibilities, while only 360 are needed). Stations would use the integer degrees of longitude and latitude, not round off. Those stations above (say) 32 degrees latitude would use only even longitudes. This would make us compatible with the European QTH system, and it would be possible to translate back and forth.